Josh Charnley has been called up to the England squad for the first time since switching back to rugby league from rugby union. 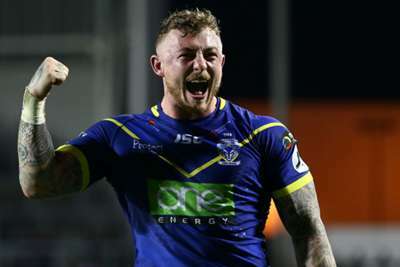 Charnley, who left Sale Sharks to join Warrington Wolves last year, has been included in a 30-man performance squad, which will meet in April. No NRL players were considered for the squad, which features six each from Warrington and St Helens, as well as 20-year-old half-back Jake Trueman, who has been one of the stars of Castleford Tigers' strong start to Super League. Wayne Bennett's men do not have a mid-season international this year. Bennett will lead a Great Britain squad on a tour of New Zealand and Papua New Guinea later in the year. Australian Bennett will travel for a second meeting of the performance squad in June. Bennett said: "We had a good year in 2018 with four wins out of five, three of them against the Kiwis, and I know the guys will be looking forward to getting together again in April – and I'm looking forward to getting across there in June." "When you think of the number of guys who are playing in the NRL, so weren't considered for this squad, it's a good pool of players we're building up – both for the Great Britain tour this autumn, and looking further ahead towards the 2021 World Cup." Great Britain face Tonga, 2017 World Cup semi-finalists, in the opening match of their tour on October 26 before twice taking on New Zealand and rounding things off against Papua New Guinea on November 16.